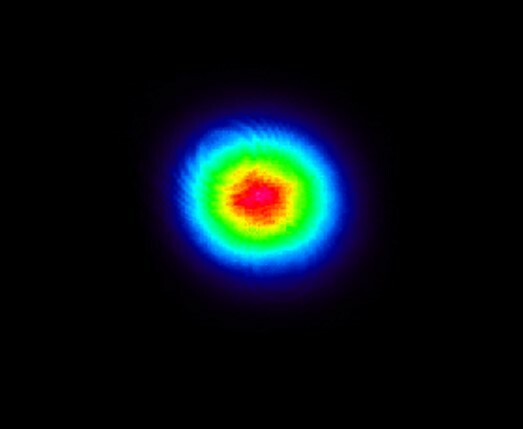 A TEM00 beam has an intensity profile that is very nearly Gaussian (>95%) and does not change as it propagates (i.e. from when it emerges from the laser to the far field). It is desirable to have a laser operate in this mode because the closer your laser is to a perfect Gaussian shape, the tighter it can be focused and the lower the divergence of the beam. M2 is a measure of how close a laser beam's intensity profile is to a perfect Gaussian distribution. If it were a perfect Gaussian beam, then M2 = 1. For any other laser beam, M2 > 1. Depending on the application and industry, M2 values of 1.1, 1.2, and even up to 1.5 may be considered high quality TEM00 beams. . 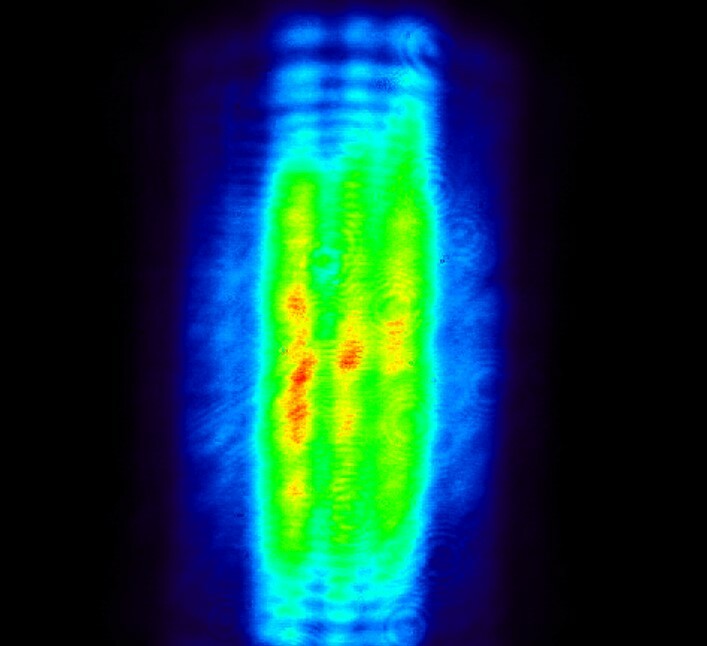 Intensity profile of a TEM00 beam from a Laserglow 532 nm DPSS laser. This measurement was made using a CMOS beam profiling camera at Laserglow's testing facility. Graph of the intensity profile of the TEM00 beam measured in figure 1 is shown in black. A perfect Gaussian intensity profile is overlaid in blue for comparison. All single Transverse Electric Mode diode lasers are considered near TEM00 or Quasi Gaussian. 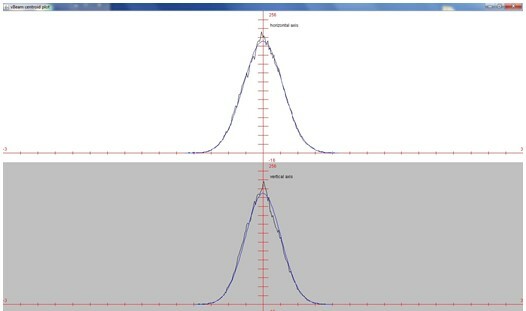 Most have a beam that can be accurately approximated by a Gaussian distribution, but with a slightly narrower central maximum and longer tail. Because of the structure of laser diodes, the divergence of the beam is greater along one axis (known as the fast axis) leading to an elliptical beam shape. They also have a highly divergent beam compared to other types of lasers, and as a result need to be collimated with additional optics. Greater divergence along the fast axis causes the beam to be clipped by the edges of the lens, which creates a diffraction pattern that manifests as side peaks along the edges or twin peaks in the center of the beam. This diffraction pattern changes shape as the beam propagates. For a collimated beam, the diffraction pattern will eventually disappear in the far field, leaving a quasi Gaussian profile. Alternatively, diffractive effects can be removed in the near field using a technique known as spatial filtering. The M2 of a near TEM00 beam can range from 1.1-1.7. The majority of near TEM00 beam diode lasers offered by Laserglow are listed with an M2 < 1.5. Intensity Profile of a Near TEM00 beam from a Laserglow 405 nm Diode Laser. 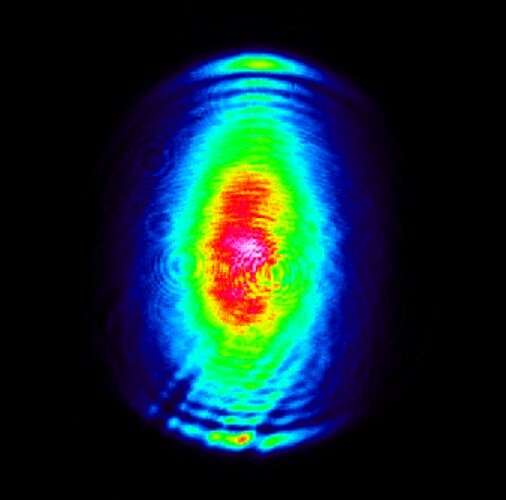 The beam is elliptical in shape with some diffractive peaks along the edges caused by clipping at the collimating lens, but can still be seen to have a nearly Gaussian profile. A graph of the intensity profile measured in figure 3 is shown in black. 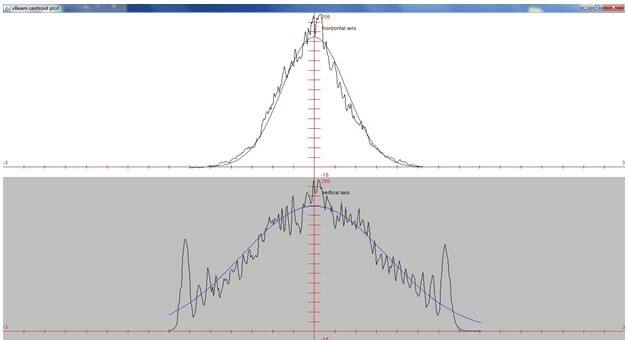 A perfect Gaussian intensity profile is overlaid in blue for comparison. Despite some diffractive peaks, we can see that the intensity distribution is nearly Gaussian, and is regarded as Near TEM00. To achieve higher powers using laser diodes it is necessary to increase the width of the diode's active layer. Such laser diodes are often called wide stripe laser diodes or broad area laser diodes. The beam emitted from a wide stripe active layer contains multiple TE modes. Each of these TE modes is quasi-Gaussian near TEM00 which combine to form a multi-TE mode beam. As the beam propagates, the individual modes gradually increase in size until they merge together to form what appears to be one wide central maxima in the slow axis direction. This gives the beam a rectangular looking shape. 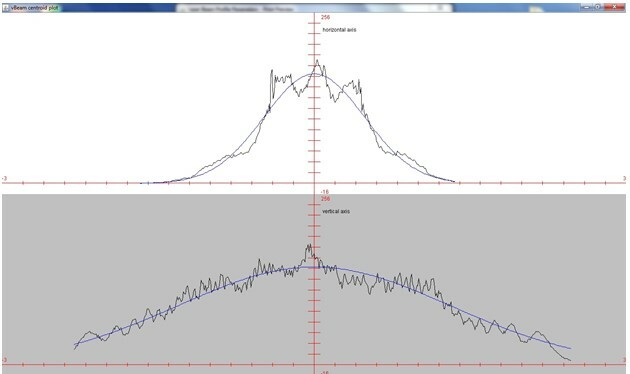 However, when the beam is focussed, the intensity profile of the focussed spot will appear to be several discrete peaks like that shown in figure 5a. Compared to TEM00 mode beams, multimode beams cannot be as well collimated or focussed to as small of a spot size. The M2 of multimode beams can vary greatly from around 3-4 for a multimode laser diode to greater than 20 for certain types of high powered lasers. Intensity Profile of a Multimode beam from a Laserglow 447 nm Multimode Diode Laser. The beam appears rectangular and can be seen to have 3 central maxima along the slow axis. The beam also exhibits some diffractive rings along the edge of the fast axis caused by clipping at the collimating lens. A graph of the intensity profile of the Multimode Laser Diode beam measured in figure 6 is shown in black. A perfect Gaussian intensity profile is overlaid in blue for comparison. Three intensity peaks are clearly visible along the slow axis. Each peak is an individual TE mode.